The European Union (EU) is encouraging photographers to take part in a street photography competition that, under strict rules, requires permission from all people being photographed. Launching its ?Cultures on my street? campaign today, organisers state: ?All European residents, regardless of age or origins, are invited to participate. It?s as easy as grabbing your camera and stepping outside the front door.? However, a close look at the rules reveals that participants ?must prove? that all individuals depicted in the submitted photos have agreed for their image to be used and that they ?posed voluntarily?. 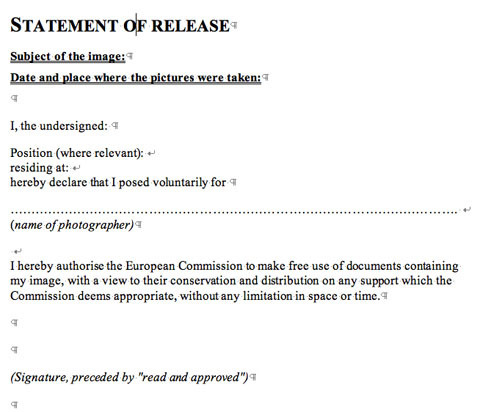 Subjects pictured must sign a model release form (pictured), giving permission for the European Union to make free use of their image. The competition forms part of the European Year of Intercultural Dialogue 2008. Subjects can represent themes such as education, religion, science, the arts, culture, minority groups and youth. Photo enthusiast John Kelly, who was stopped by police while taking pictures in Blackpool last month, believes the rules will lead to ?contrived? pictures and that photographers will have problems getting permission from subjects. ?I would find it difficult myself,? he told us, questioning when is the right time to ask such permission for the purposes of a natural photograph. Challenged over the rules, a competition spokesman told us that the model release rules ?are not meant to inhibit photographers going about their everyday business?. He said they are included as a ?common courtesy? to ensure people are aware that their image may be used on promotional booklets and on posters across Europe. The spokesman added that with different laws in each country it would be difficult, logistically, to draw up different rules for each nation. The contest?s ?15,000 prize pot includes photo equipment and trips to European cities. Organisers add: ?Everyone has a story. Now that the borders within Europe are fading, people from an even greater mix of cultures and backgrounds are coming together, mingling their voices in an ever-growing dialogue of their unique stories and experiences.? The closing date is 30 June and winners will receive their prizes at a ceremony in Brussels, Belgium, in September. Rules state that entrants must also agree to the subsequent use of their photo by the European Commission in relation to the European Year of Intercultural Dialogue 2008.